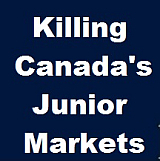 Killing Canada's Junior Markets is an ongoing series that looks at the problems plaguing the Capital Markets in Canada. Killing Canada's Junior Markets - John McCoach – Regaining Investor Confidence. Killing Canada's Junior Markets - John Kaiser – Looking at ways to bring structure back to the Junior Markets in Canada. April 9th, 2016 | Uptick Rule – The Solution? Killing Canada's Junior Markets - Graeme O’Neill – Return to the Uptick Rule in Canada. August 22nd, 2015 | Junior Markets. March 7th, 2015 | Canada’s Junior Equity Markets in Crisis ?